It is widely held that the systolic BP is the more important threshold (and therefore target) in the elderly, in whom isolated systolic hypertension (ISH) is commonly seen (possibly indicating a marker of increased peripheral resistance or increased fluid overload). 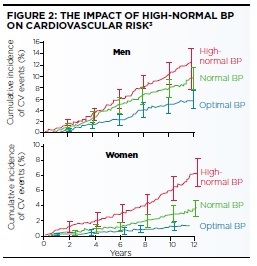 Conversely, diastolic BP is arguably the more significant threshold in the under-55s. The BHS/NICE guideline5 recommends all patients should have five-yearly blood pressure checks as a minimum and if greater than 130/85mmHg, then assessed annually. This guidance further suggests the use of ambulatory blood pressure monitoring (ABPM) as the best predictor of cardiovascular events. However, there are substantial cost and resource implications in terms of GP acquisition of appropriate number of machines or onward secondary care referral for such assessment. Use of home blood pressure monitoring (HBPM) is a very practical alternative, as many such units can be purchased for the price of a single ambulatory blood pressure monitor (around £1,000-£3,000). As long as these are regularly calibrated, the HBPMs are effective in diagnosing hypertension away from the surgery, as well as assessing the benefits of treatment. HBPMs are popular with those patients who recognise the validity of the initial diagnosis and subsequent target attainment (or otherwise), thereby enhancing concordance with both lifestyle and treatment plans. Practically, the BP is checked twice daily for four to seven days (we use seven days), discarding day one readings which tend to be atypically high (possibly suggesting a “white coat” effect even in the home environment). The average calculated is then used to confirm (or exclude) hypertension (>135/85 based on the premise that home readings are reliably lower than clinic or office based readings – effectively equating with 140/90 in the office setting). Newly presenting patients with hypertension require assessment in terms of both risk factors and future management. Obesity, inactivity, diet, alcohol intake and diabetic control are all important modifiable risk factors in either the genesis or impact of raised blood pressure. The effect of age, gender, race, smoking history etc. need also to be assessed in calculating global risk of cardiovascular harm. It is imperative to arrange appropriate investigations aimed at identifying a secondary cause of hypertension and to test for target organ damage. Such investigations should typically include renal function tests, fasting blood sugar and lipid profile, uric acid and full blood count. Further urinalysis is important to check for proteinuria and microalbuminuria. An ECG is useful in assessing for left ventricular hypertrophy (LVH). 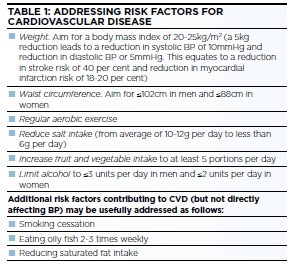 All of these factors will impact upon global cardiovascular risk which will be calculated utilising either JBS3 (Joint British Societies guidelines -3rd version updated June 2014) or QRISK2 (January 2012 version). These tools provide prediction algorithms for cardiovascular risk utilising factors such as age, gender, ethnicity, BMI, smoking status, lipid data, SBP, family history of premature cardiovascular disease, chronic kidney disease (CKD), atrial fibrillation (AF), rheumatoid arthritis, diabetes mellitus, and social status (using Townsend quintile for JBS and postcode for QRISK). These will also inform broader patient management. Particularly in younger patients presenting with hypertension, consider secondary causes such as Conn’s syndrome6 – where an aldosterone to renin ratio would inform diagnosis, or phaeochromocytoma, where the level of urinary vanillylmandelic acid (VMA) will confirm or refute the diagnosis. These will require specific management strategies. In practice, more than 95% of hypertensive patients will have no clear underlying cause (and therefore be diagnosed with primary/essential/idiopathic hypertension in today’s understanding) and need a holistic approach to their care. This will involve management of lifestyle along with possible pharmacotherapy in a systemised evidence-based fashion. The consultation should reflect this by explanation of the effects of blood pressure on overall health and the benefits of all the interventions systematically. Benefits of blood pressure reduction In the 1970s and 1980s there was much debate about the “J-shaped” curve, where too low a bloodpressure conferred additional cardiovascular risk. Interestingly, the diabetic subset of HOT did best of all with a >50% reduction (p=0.005) in cardiovascular events with attained mean diastolic blood pressure (DBP) of 81mmHg, compared with a mean of 85mmHg in the total study population. The results from the National Health And Nutrition Examination Survey (NHANES II)9 and results from Framingham also showed that reducing DBP by 5mmHg led to a 16% reduction in coronary heart disease and a 38% reduction in stroke. More recent trials, including ASCOT12 and VALUE,13 have demonstrated the benefits of early blood pressure control gaining the best reduction of long-term cardiovascular risk. 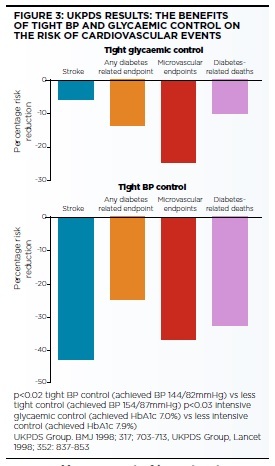 BP thresholds for intervention include >160/100mmHg in uncomplicated hypertensives and >140/90mmHg for those with target organ damage, diabetes and those who are at increased cardiovascular risk over the next decade.4 NICE points out that there have been no large trials randomising hypertensive patients to different BP targets with sufficient power to assess clinical outcomes in terms of optimal BP targets. Current guidance is therefore based on targets adopted by clinical trials. Accordingly, the NICE guideline5 suggests a BP target of <140/90mmHg for clinic readings or <135/85mmHg for ABPM/HBPM average daytime readings. For patients over the age of 80, the target is set less stringently at a clinic BP of <150/90mmHg, reflecting the practical difficulties of target attainment in the elderly. In patients with the comorbidities ofdiabetes or target organ damage, or those with a higher predicted cardiovascular risk, the target is set tighter at 130/80mmHg. The next expected BHS/NICE guidelines are anticipated in September 2015. Meanwhile, the European Society of Hypertension (ESH) and European Society of Cardiology (ESC) produced revised guidelines for 2013 recommending a single SBP of 140mmHg for virtually all patients, but aiming for a DBP of <85mmHg for those with diabetes. They have also placed greater emphasis on assessment of global cardiovascular risk. Interestingly, and perhaps contrary to expectation, the American JNC8 (8th report of the Joint National Committee on prevention, detection, evaluation and treatment of high blood pressure) has slightly relaxed the aggressive JNC7 targets and treatment thresholds in patients under 60 years old with diabetes and chronic kidney disease, adopting an ESC-like approach. JNC8 has also backed away from recommendation that thiazide diuretics should be initial treatment in most patients, suggesting that ACE inhibitor/angiotensin receptor blocker (ARB)/calcium channel blocker (CCB) or thiazide-like diuretics are equally reasonable options. The suggested goals are <150/90mmHg for patients over 60 years of age and <140/90mmHg for everybody else. Last summer, NICE recommended tighter blood-pressure control in QoF targets for those with coronary heart disease, stroke or transient ischaemic attack (TIA), or peripheral occlusive arterial disease (POAD) to a target <140/90mmHg (lower than current 150/90mmHg). These will be implemented in April 2015 (CKD target is already at 140/85mmHg). These have an impact on blood pressure at many levels and risk factors tend to cluster in the environment of cardiovascular disease. It is therefore imperative that appropriate changes be recommended to all patients presenting with elevated blood pressure. ALLHAT (the Antihypertensive and Lipid-Lowering treatment to prevent Heart Attack Trial, 2002)17 compared the relative benefits of thiazide diuretics, calcium channel blockers, ACE inhibitors and alpha-blockers in hypertension management by assessing future cardiovascular events. In fact, apart from alpha-blockers which seemed to have a negative impact on cardiac failure, there was little to differentiate between the other agents. It also formally recognised the need to combine regimes for achieving target blood-pressure attainment. The earlier HOT trial (1998)7 made a similar conclusion, with 70% of hypertensive patients needing >2 drugs to hit target, and this was reinforced by the findings of ASCOT, published in 2005.11 Indeed, only approximately 25% of hypertensive patients gain blood pressure control with monotherapy. This polytherapy improves efficacy by blocking different pathways of homoeostasis. In the five years from 1998, use of monotherapy saw a reduction of >25%, while combination therapy increased by 50%. This trend continues to rise as more aggressive target attainment is sought. A study in 200718 revealed the United States to be the most aggressive at increasing medication for poorly controlled hypertension (38% of patients), while the United Kingdom came second (28%) at approximately double the levels of France (15%) and Germany (16%). Sadly, this did not translate into equivalent levels of target attainment, with the US best (at 134/79mmHg) and the UK worst, apart from Italy, at 140/82mmHg. JNC guidelines favour the use of FDCs as these are more convenient, simplify the regimen and often cost less than the individual components. As in Europe, the US recommends use of first-line combination therapy if the blood-pressure is >160/100mmHg, a practice not yet formalised in the UK. Synergy is seen with certain drug regimens along with the benefit of improving concordance seen with FDCs. This was clearly demonstrated by Feely et al19 comparing the efficacy of a polypill containing one quarter of the usual dose of four drugs (atenolol/amlodipine/captopril/ bendroflumethiazide) with standard doses of each separate component. The combination regime in the polypill hit blood pressure target 50% more than its nearest competitor. Other trials20,21 have illustrated between 17% and 25% better concordance with FDCs, compared with two separate agents. The pharmacology of drug groups can help inform the best combinations to use; for example diuretics possess a relatively flat dose-response curve but increase side effects with dose elevation. This also obtains for CCBs and beta-blockers. However ACE inhibitors and ARBs show a better dose-response effect with little increase in side-effects. This dictates that where possible we should keep the dose of the C and D group low while preferentially up-titrating the A group. The ACCOMPLISH trial22 revealed that FDCs increased blood pressure control rates by more than double (37%-76%). Another study showed 30% better blood-pressure target attainment with high (>80%) compared with low (<50%) concordance.23 There are various fixed dose antihypertensive combinations available in the UK, including, for instance, AC/AD/ACD with different dose combinations represented. At present these are almost always available nongenerically and so are currently generally discouraged by prescribing advisers because of cost implications. It is likely that these will be favoured when they become generic with corresponding cost reductions. Early NICE guidance was simplistically based on a “thiazide/beta-blocker for all” approach, to which further drugs could be added to attain target. 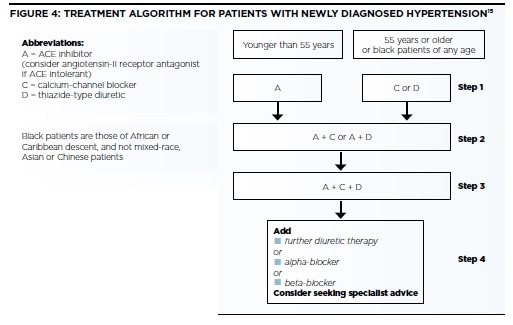 Post BHS IV, NICE has modified its advice to the ACD principle in a combined approach.16 Over a decade ago Brown et al14 identified a renin-based mechanism utilising age and ethnicity to inform appropriate initial choice of medication based on the then AB/CD rule (where A equals ACE inhibitor/ARB; B equals beta-blockers; C equals CCBs; D equals diuretics). This was subsequently modified in BHS IV guidance to ACD,15 since it was recognised beta-blockers increase risk of diabetes and, rather counter-intuitively, atrial fibrillation. Beta-blockers have therefore been relegated to step 4 (See Figure 4) in current guidelines unless there is associated coronary heart disease or cardiac failure when they remain a first-line choice. The ACD algorithm is based on the principle that white people less than 55 years of age have, in the main, a renin-dominant hypertension, while white people over the age of 55 years and black people of any age will have an initially low-renin state associated with their hypertension. Renin-inhibiting agents will include the A agents in this algorithm while medications in the low-renin state are the C or D groups. The algorithm illustrates the next therapeutic move to gain target blood pressure attainment. Step 4 includes beta-blockers, alpha blockers or additional diuretics. This has been haphazard until recently when Brown et al14 recognised that a renin assessment at this point could be used to more discriminately decide on next therapeutic manoeuvre. Normal renin levels would guide us to use an alpha blocker; high renin levels a beta-blocker, while low levels suggest adding further diuretics (mainly for use in the elderly) – thereby giving birth to the “alpha beta delta” add-on acronym to ACD. NICE has calculated the cost of implementing their joint guidelines with BHS to be approximately £60 million, counterbalanced by calculated savings of approximately £300 million as a result of reduced morbidity, reduced incidence of diabetes and atrial fibrillation etc. Better control of blood pressure would improve these figures and the health of our nation. 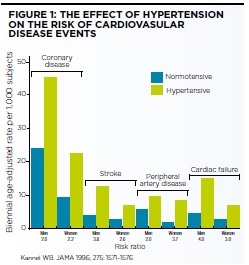 Hypertension causes a large amount of morbidity and mortality and costly hospital admissions. It is still being managed suboptimally, even when diagnosed, and it is still under-diagnosed. Doctors, nurses, pharmacists and allied health professionals must strive to diagnose hypertension accurately and more comprehensively and manage it with appropriate lifestyle modifications and drug treatment driven by a wealth of evidence. The calculation of targets is somewhat pragmatic and entirely related to the interpretation of clinical trials and therapeutic realism. This author’s guidelines have been similarly created as below since it is felt these are most likely to be remembered and attained: nnMeasure blood-pressure reliably and accurately nnTreat if blood pressure is >160/100mmHg or >140/90mmHg with comorbidities nnTreat using lifestyle modifications plus polypharmacy if necessary (using the simplest regimen possible to enhance concordance) putting targets of 140/85mmHg or 130/80mmHg where there is diabetes or target organ damage evident. This approach will also future proof against planned QoF changes and accords with observational data from Framingham and other key trials.